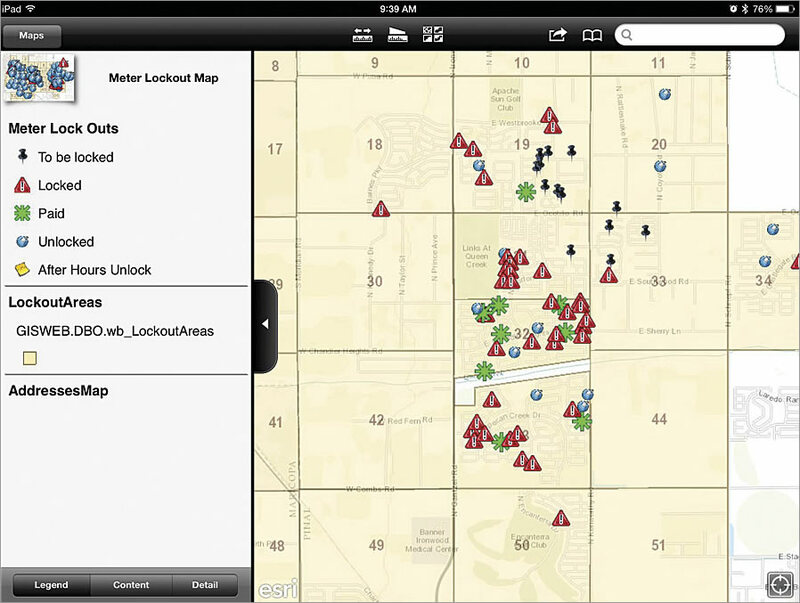 Field staff use iPads to stay informed of paid accounts in real time so they know when to lock and unlock meters. The town of Queen Creek, Arizona, supplies water to more than 21,000 customers. Every month, the utilities department shuts off service to approximately 200 water customers whose accounts are past due to prompt them to pay their bills. To shut off the water, utilities employees place locks on the delinquent water meters until the customers pay their bills. When an account gets paid, a utilities employee removes the lock. For seven years prior to 2014, the lockout process was done manually and was very labor intensive. So the town’s GIS staff decided to improve the system by creating an interactive map that would enable the utilities staff to more easily access the information. Queen Creek’s utility mapping and inspections supervisor, James Gardner, and its GIS coordinator, Shawny Ekadis, began by documenting the existing workflow and identifying the challenges that needed to be addressed. Meter lockout days were chaotic from the start. Up to 20 field staff members had to go to the municipal services building in the morning to pick up their lockout assignments, which were printed on work order forms and accompanied by paper maps. They then had to travel all over town, as assignments were based on the number of locks that had to be put on rather than geographic location. Once customers’ meters were locked, they had to call the utilities office to make their payments before they could get their meters unlocked. Work orders were then printed again to assign meter unlockings, and the field staff would have to return to the office multiple times throughout the afternoon to get these printouts; they then had to go back out into the field to complete the assignments. The customer service staff spent a lot of time on the phone contacting crews and supervisors while dealing with unhappy customers. The process took all day, and many customers waited hours to get their service restored. Working closely with employees from the utilities department, Gardner and Ekadis spent a great deal of time defining what the new workflow should be. The solution needed to accommodate both office and field staff and be accessible to anyone in the organization who might need the information. The town already had many useful resources that the GIS staff wanted to use, including water meter data, ArcGIS for Server, ArcGIS Online, ArcGIS Viewer for Flex, and iPads. ArcGIS for Server made it possible to publish maps with real-time data showing the current status of accounts being locked and unlocked that day. The GIS team also set up ArcGIS Online accounts, which allowed field staff to view maps on iPads using the ArcGIS app for iPad. Since additional staff needed access to the data, the GIS team used ArcGIS Viewer for Flex to create a web mapping application for ArcGIS for Server. Queen Creek participates in Esri’s Community Maps Program as well, so the basemap used in the utilities department’s interactive map includes data that was submitted through the program. With the foundations in place, Gardner and Ekadis rolled out the first map. They had utilities field staff test it and provide feedback, which helped them make improvements. The resultant map shows the location and status of each account to be locked. It is set up the night before so it is ready to use in the morning. All staff members can see the live status of each account throughout the day. Customer service staff, who stay in the office, keep the map updated in ArcGIS Viewer for Flex. If an account gets paid overnight, it is recorded first thing in the morning so the customer does not lose water service. During the day, customer service staff update account statuses as customers pay their bills, which automatically updates the iPads. This keeps field staff informed of paid accounts in real time so they know when to unlock meters. It also curtails the customer service department’s need to make multiple phone calls to field crews. Field staff, who now total just seven, no longer have to come into the office on meter lockout days to get work orders and maps. What’s more, they are assigned to specific geographic areas for lockouts, making them more efficient and allowing them to do other work in the field as well. They monitor their areas, and when they see that an account has been paid they unlock the meter without returning to the office for a second work order or waiting for a phone call from customer service staff. Supervisors also have access to the maps so they can oversee the process. Lockouts are now completed in two hours and unlocks within 30 minutes of the account being paid. An additional benefit of the map is that it allows staff to flag for follow-up any accounts that have not been paid to make sure customers do not go without water service. The utilities department also now has historical data that it can use to identify patterns so it can hone its customer outreach and education efforts. The meter lockout map has been so successful that the GIS staff is looking at how to duplicate the process in other areas of administration. For more information, contact Shawny Ekadis, GIS coordinator, Town of Queen Creek.